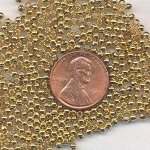 We carry an assortment of metal beads, brass beads, silver plated beads, gold plated beads in a variety of types, styles, shapes and sizes. Metal beads are very durable and have holes for stringing which are used in jewelry making, beading, jewelry designing and as craft supplies for crafting projects. We provide unique metal beads, brass beads, silver plate beads, gold plate beads that are out of production which date back to the 1960's until present to create a metal based effect in your designs. Wholesale beads, wholesale bead, wholesale vintage beads, vintage beads, beading supplies, wholesale beading supplies.